WHAT: The University of Illinois Springfield presents the 35th annual International Festival with the theme “Spice It Up”. WHEN: Friday, November 9, 2012 from 5-8 p.m. 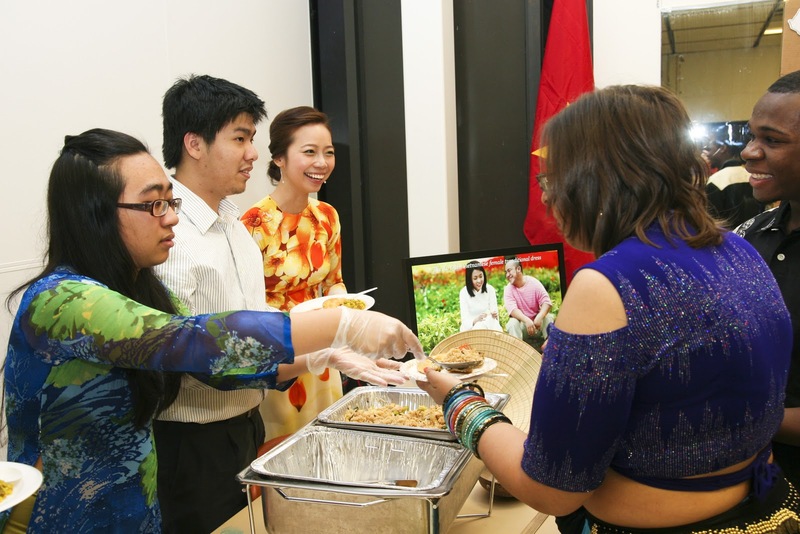 DETAILS: For over 30 years, the University of Illinois Springfield family has celebrated its rich international and cultural diversity with the annual International Festival. Friends from the greater Springfield community will be joining UIS students, faculty, and staff to share an evening of cultural recipes and exhibits, artistic performances, food tasting, and more, all with the international flavor that you have come to expect over the years. Again this year, in order to make the festival accessible to all, we are not charging admission. Guests will have the opportunity to make a recipe book during the event. Every vendor will feature a unique recipe for guests to add to their recipe book. Be sure to pick up a program as you enter, so that you can find your way to the exhibits, cuisine, and performances in which you are most interested. Plan to spend some time getting to know people you have never met before, literally from every part of our world! For more information, contact the Office of International Student Services at 217/206-6678 or e-mail iss@uis.edu. Illinois Innocence Project presents "DNA as Evidence"
WHAT: The Illinois Innocence Project, based at the University of Illinois Springfield, is giving you a chance to learn about DNA. The project will host a lecture by Cris Hughes, Ph.D. from the Department of Anthropology at the University of Illinois at Urbana-Champaign (UIUC). She will discuss how human genetic variations in DNA can be used in a variety of contexts. WHEN: Monday, November 5, 2012 at 6 p.m. DETAILS: Participants will learn ‘the basics’ of forensic DNA, understand how DNA testing is used in the criminal justice system, and discover the science behind genetics at Native American anthropological sites. Hughes will discuss how DNA has been used in her work on the border at the Pima County Office of the Medical Examiner in Tucson, Arizona. She will also discuss her work at the Malhi Degraded DNA Laboratory at UIUC, which focuses on living and ancestral genetic variation in Native Americans. Additionally, she will address the way that degraded DNA, associated with crimes, is processed and used in cases. WHAT: University of Illinois Springfield students will be tying yellow ribbons and hanging them around campus in honor of the upcoming Veterans Day holiday. Students will also be collecting toiletries to send to troops. WHEN: Sunday, November 4, 2012 at 1 p.m. DETAILS: The event is designed to raise awareness on campus about Veterans, specifically students, who have served or are currently serving our country. 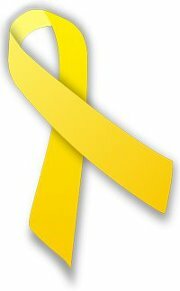 Community members and students are invited to help hang the yellow ribbons and share their Veterans’ stories. Along with the event, students will be holding a toiletry drive that will accept donations such as toothpaste, toothbrushes, toilet paper, bars of soap etc. Cash donations to assist deployed service members will also be accepted. This event is co-sponsored by UIS Veteran Affairs, College Republicans, Residence Life, Resident Housing Association, Alpha Phi Sigma, Undergraduate Advising, Organization of Latin American Students, Lambda Pi Eta, UIS Habitat for Humanity, Communication Club, Volunteer Civic Engagement Center, Diversity Center, & the LGBTQA Resource Office. UIS will also be holding a Veterans Day flag raising on Monday, November 12 at 9 a.m. in front of the Public Affairs Center. For more information, contact the UIS Volunteer & Civic Engagement Center at 217/206-7716 or volunteer@uis.edu. Participants may RSVP to attend the event at https://www.facebook.com/events/105679719592131/. WHAT: University of Illinois Springfield students will be going door-to-door on Halloween night collecting canned goods for the Central Illinois Foodbank. The annual competition between students kicks off the UIS Holiday Stars Project, a month-long collection initiative on campus. 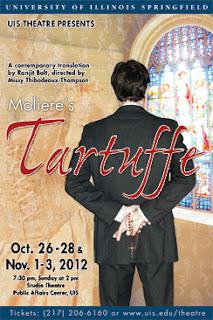 WHEN: Wednesday, October 31, 2012 from 4:30 to 8 p.m. DETAILS: The UIS Holiday Stars Project, coordinated by the UIS Volunteer & Civic Engagement Center, is a campus-wide service initiative giving focus to UIS’ efforts to make a difference in the local community during the upcoming holiday season. The overall goal is to collect more than 8,000 pounds of food for the Central Illinois Foodbank by December. The 14 teams, consisting of over 150 students, that have registered for the Trick or Treat for Canned Goods drive have been assigned to neighborhoods where they will collect non-perishable food items. Earlier this month, the teams canvassed the neighborhoods and distributed door hangers that explained the project. Collected items will be returned and weighed on campus and prizes will be awarded to teams that collect the most food. The Holiday Stars Project continues through November, when specially marked collection bins will be placed around UIS. Everything collected during the project will be presented to the Foodbank in early December. The Central Illinois Foodbank distributes over 8 million pounds of food annually to over 150 food pantries, soup kitchens, residential programs and after-school programs in a 21 county region. For more information on the UIS Holiday Stars Project, contact Mark Dochterman, director of the UIS Volunteer & Civic Engagement Center, at 217/206-8448, or go to www.uis.edu/holidaystars. The University of Illinois Springfield recognized scholarship donors during the annual Scholarship Luncheon on October 24, 2012. “When you give a scholarship you give time, you give talent, and time in allowing students to fully develop and reach their potential,” said UIS Vice Chancellor for Development Jeff Lorber. Nearly 300 people attended the celebration in the Sangamon Auditorium lobby. For many of the donors it was their first time meeting the students they support. “It’s wonderful because you really get to experience their joy and their appreciation and you get to see that it is a real person and you get to find out about their life and how it’s helping them,” said Julie Staley, a scholarship donor. “Getting an education at the University of Illinois Springfield, this is a great school, so I want to get a degree here, hopefully a master’s, if not farther,” said Hoschar. Glen and Lola Garrison attended the Scholarship Luncheon for the first time this year and were impressed by their recipient Jinger Sanders. UIS Chancellor Susan J. Koch updated the audience about UIS’ growth and the latest developments on campus before thanking donors for their support. “I’m deeply grateful to each of you who believes in the future of UIS, in the importance of a university education, and the education of your particular student,” said Koch. WHAT: The University of Illinois Springfield Engaged Citizenship Common Experience (ECCE) Speakers Series presents “Hopi Running” as part of American Indian Heritage Month. Matthew Sakiestewa Gilbert, assistant professor of American Indian studies and history at the University of Illinois at Urbana-Champaign (UIUC) will lead the discussion. WHEN: Monday, November 5, 2012 at 7 p.m. DETAILS: This talk will discuss Hopi running past and present and the ways Hopis have used running to combat obesity, diabetes, and to further Hopi culture on the Reservation. Hopis are historically known for their ability to run great distances in record time. Sakietewa Gilbert is enrolled with the Hopi Tribe from the village of Upper Moencopi in northeastern Arizona. Centering his research and teaching on Native American history and the history of the West, he examines the history of American Indian education, the Indian boarding school experience, and American Indians and sports. Sakiestewa Gilbert received his Ph.D. and M.A. in history from the University of California, Riverside, and holds a M.A. in theology from Talbot School of Theology/Biola University. WHAT: The Global Issues Club, College Republicans, and College Democrats at the University of Illinois Springfield will host a presidential debate watch party for students and the public on campus. WHEN: Monday, October 22, 2012 at 7:30 p.m. DETAILS: President Barack Obama and GOP presidential nominee Mitt Romney will hold their final debate of the 2012 campaign on Monday, October 22. The debate will focus on foreign policy. UIS students will gather in the Homer L. Butler Housing Commons to watch the debate on television. A post-debate discussion will be moderated by UIS Political Science Professor Stephen Schwark. For more information, contact Blake Wood, UIS Campus Relations, at 217/206-6716 or bwood8@uis.edu. WHAT: The Political Art and the Public Sphere (PAPS) series at the University of Illinois Springfield presents a screening of the documentary RED RED RED. 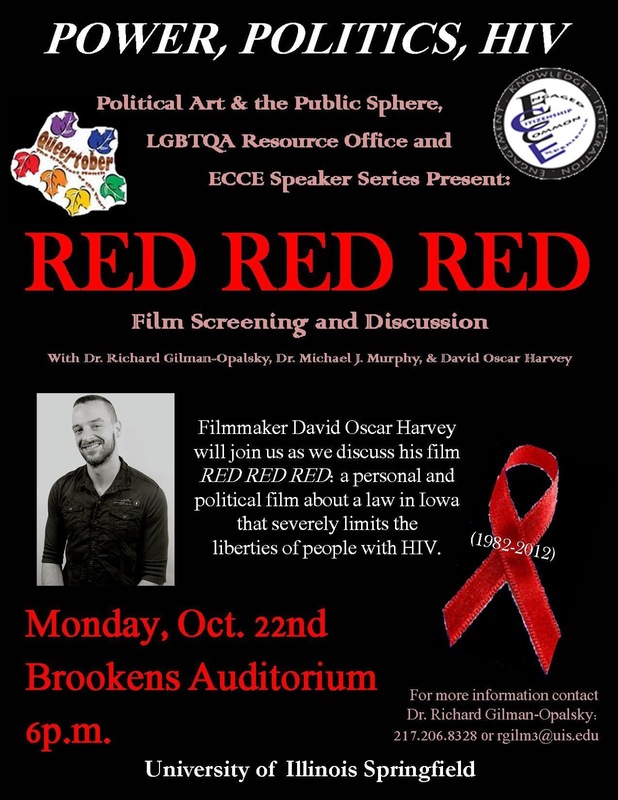 The film by David Oscar Harvey focuses on a law in Iowa that severely limits the liberties of people with HIV. Following the screening, Harvey will take questions from the audience during a group discussion. WHEN: Monday, October 22, 2012 at 6 p.m. DETAILS: RED RED RED is a personal and political film that considers big questions about the contemporary state of queer politics and the dimensions of identity for HIV-positive persons. The film has screened at numerous film festival internationally. Harvey is a filmmaker and Ph.D. candidate at the University of Iowa in the Department of Cinema and Comparative Literature. He is also an educator, activist, artist and scholar regarding issues surrounding HIV/AIDS. His academic writing on HIV/AIDS has been published in a variety of journals. 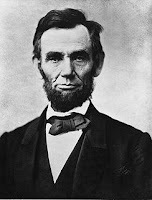 The University of Illinois Springfield Political Science Department presents the third annual Wepner Symposium on the Lincoln Legacy and Contemporary Scholarship, to be held Oct. 19-20, 2012. Portions of the symposium will take place on the UIS campus and the Old State Capitol in downtown Springfield. The symposium brings together scholars with diverse intellectual backgrounds, from political science to history and economics, and also seeks to bridge the gap between K-12 and university education. This year's theme is "Emancipation: What Came Before, How It Worked, and What Followed". All events are free and open to the general public. Events begin on Fri., Oct. 19 with the Holtz Memorial Lecture, entitled “How a Railroad Lawyer Became the Great Emancipator: Lincoln and the Constitutional Limits on Emancipation”, at 7 p.m. in Brookens Auditorium, located in the lower level of Brookens Library at UIS. Paul Finkelman, John Hope Franklin Visiting Professor of American Legal History at Duke University School of Law and President William McKinley Distinguished Professor of Law and Public Policy at Albany Law School will speak. 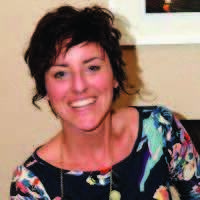 Lisa Piergallini from the University of Nevada, Las Vegas will discuss “Emancipation, Liberty, and Defense Strategy: Commentary”. Day two of the Wepner Symposium begins on Sat., Oct. 20 at 8 a.m. at the Old State Capitol in downtown Springfield. The morning theme will focus on “The Politics of Emancipation & Civil Rights after Emancipation” and will run until Noon. Featured speakers include Sally Heinzel, University of Illinois at Urbana-Champaign; Jackie Hogan, Bradley University; Neal Allen, Wichita State University; Richard Sobel, Northwestern University & Harvard University; and Rogers Smith, University of Pennsylvania. Following lunch, the afternoon topic turns to “Cultural Bias and Historical Memory” from 1 to 5 p.m. at the UIS Public Affairs Center, Conference Rooms C/D. Afternoon speakers include Matthew Holden, Jr., University of Illinois Springfield; Roger Bridges, Rutherford B. Hayes Presidential Center; Matthew Norman, University of Cincinnati Blue Ash College; Gwen Jordan, University of Illinois Springfield; John Barr, Lone Star College – Kingwood; Stephen Schwark, University of Illinois Springfield; Chris McDonald, Lincoln Land Community College; and Heather Bailey, University of Illinois Springfield. Archie Lawrence from Springfield will deliver a commentary. For more information on the Wepner Symposium, contact Gene Giannotta at ggiannot@uis.edu. The symposium can be found online at www.uis.edu/wepner/ and on Facebook at http://on.fb.me/mQBrO5. Speakers Series presents "The Freshwater Crisis: Challenges and Solutions"
WHAT: The University of Illinois Springfield Engaged Citizenship Common Experience (ECCE) Speakers Series presents “The Global Freshwater Crisis: Challenges & Solutions”. The discussion will be led by Gary Lamberti, professor and chair of Biological Sciences at the University of Notre Dame. WHEN: Wed., Oct. 24, 2012 at 7 p.m.
WHERE: Sangamon Auditorium Lobby, on the 2nd level of the Public Affairs Center. DETAILS: The planet’s fresh water supply is arguably in jeopardy with more than one billion people lacking access to clean water and more than three billion people lacking sanitation for their waste. Toxic chemicals ranging from metals to pharmaceuticals enter, accumulate, and bio-magnify in fresh water habitats. As a result, fresh water is globally threatened, with fish, mussels, and crayfish being the most endangered groups of animals worldwide. Human and environmental well-being is dependent on the presence of high-quality and plentiful freshwater resources. In the discussion, Lamberti will address how the planet and human populations can deal with this fresh water crisis and explain possible solutions to ensure a plentiful supply of clean fresh water for future generations. 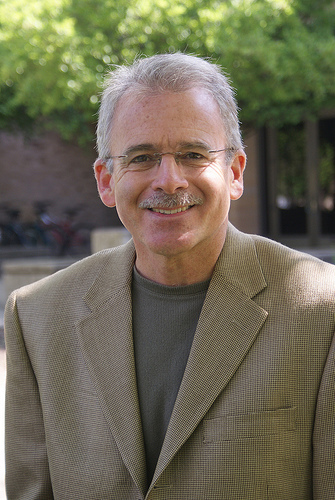 Lamberti, author of more than 130 scientific publications, and past editor of Methods in Stream Ecology, received his doctorate from University of California (Berkeley) in 1983. 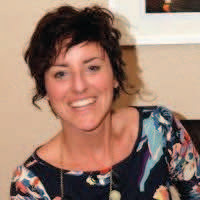 Lamberti is an aquatic ecologist and environmental scientist whose research focuses on salmon biology, the ecology of invasive species, wetland conservation, and river restoration. At Notre Dame, he teaches biostatistics, stream ecology, and restoration ecology. Lamberti is also a past president of an international society of aquatic scientists. This event is co-sponsored by the Notre Dame Club of central Illinois and is free and open to the public. 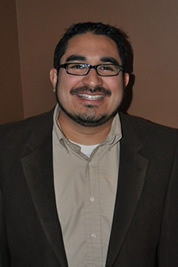 For a list of other ECCE Speakers Series events and more information, visit http://illinois.edu/goto/speakerseries. 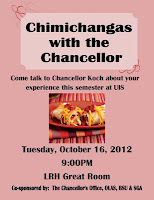 Students invited to have "Chimichangas with the Chancellor"
WHAT: UIS Chancellor Susan J. Koch, along with the UIS Student Government Association (SGA), Organization of Latin American Students (OLAS), and Black Student Union (BSU) will host “Chimichngas with the Chancellor”. WHEN: Tuesday, October 16 at 9 p.m. 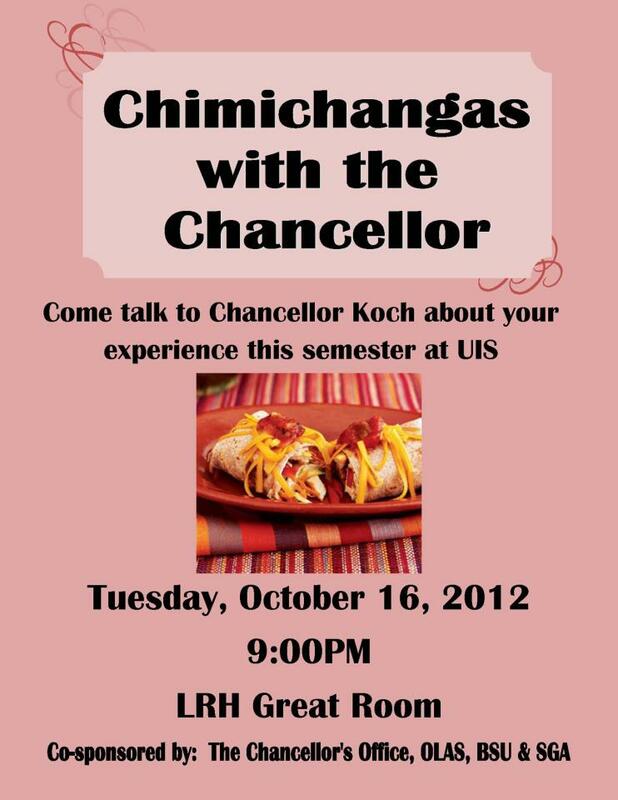 DETAILS: The forum will allow students to share their ideas and opinions with Chancellor Koch over FREE chimichangas in an informal setting. This is the third forum in a series designed to create an ongoing open exchange of ideas between students and Chancellor Koch. The idea is to make the campus’ top leader more available to students in a comfortable environment. UIS Speaker Series presents "Asian Americans Are (Not) Funny? : Comedy and Racialization"
WHAT: The University of Illinois Springfield Engaged Citizenship Common Experience (ECCE) Speakers Series presents “Asian Americans Are (Not) Funny? : Comedy and Racialization”. The discussion will be led by Caroline Kyungah Hong, assistant professor of English at Queens College CUNY. WHEN: Tuesday, October 23, 2012 at 10 a.m. DETAILS: Hong's talk will discuss the common misconception in U.S. popular culture that Asian Americans are not funny, unless they’re being made fun of for their physical, cultural, and social difference. Asian American comedy and humor employ the very same mediums that have historically been used to exclude and mark Asian Americans as the racial other, in order to destabilize prevalent images of Asian Americans as the yellow peril, the perpetual foreigner, and the model minority. Through examining the past, present, and future of Asian American comedy and humor, it discusses how Asian American comedic tradition challenges stereotypes and fixed notions of race, gender, sexuality, and class. 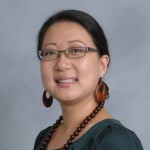 Hong’s research interests include Asian American studies, comedy and humor, ethnic studies, women writers of color, gender and sexuality studies, race and popular culture (especially film, TV, and comics/graphic narratives), and American studies. 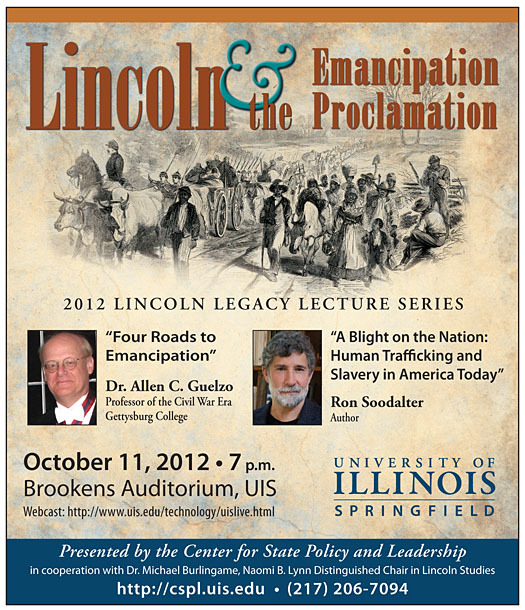 The 10th Annual Lincoln Legacy Lectures presented by the University of Illinois Springfield will be held from 7 to 9 p.m. Thursday, October 11, 2012 in Brookens Auditorium, located on the lower level of Brookens Library at UIS. This year’s topic is “Lincoln and the Emancipation Proclamation.” The lectures, and a reception and book signing that will immediately follow, are free and open to the public. No reservation is required. The Lincoln Legacy Lecture Series brings nationally known scholars to Springfield to discuss issues that are of contemporary interest and also engaged Abraham Lincoln and citizens of his era. This year’s featured speakers are Dr. Allen C. Guelzo, director of Civil War Era Studies at Gettysburg College, and Ron Soodalter, historian and author. 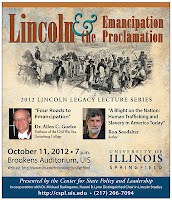 Dr. Michael Burlingame, Chancellor Naomi B. Lynn Distinguished Chair in Lincoln Studies at UIS, will serve as moderator. Guelzo is one of America’s foremost Lincoln scholars and author of many books on Lincoln and the Civil War, including Lincoln’s Emancipation Proclamation: The End of Slavery in America (Simon & Schuster, 2004) and Fateful Lightning: A New History of the Civil War and Reconstruction (Oxford University Press, 2012). Soodalter is the author of The Slave Next Door: Human Trafficking and Slavery in America Today (with K. Bales, University of California Press, 2010) and Hanging Captain Gordon: The Life and Trial of an American Slave Trader (Atria, 2006). The Lincoln Legacy Lecture Series is sponsored by the UIS Center for State Policy and Leadership in cooperation with the Lynn Chair in Lincoln Studies. Cosponsors of this year's event are: College of Liberal Arts and Sciences, College of Public Affairs and Administration, Shelby Cullom Davis Charitable Fund, Engaged Citizenship Speakers Series, Illinois Issues, Illinois State Library, University of Illinois Alumni Association, and WUIS Public Radio.